The Australian Environmental Justice (AEJ) research team at RMIT University is creating a public online database of cases of environmental injustice — for affected communities, campaigners and educators. The AEJ project has Friends of the Earth Australia (FoEA) as a partner and is associated with the EU-funded international Environmental Justice Organisations, Liabilities and Trade (EJOLT) project (http://www.ejolt.org/project). Environmental injustices arise where developments prejudice the environments of residents, regions and/or workers health and other lifestyle costs. Damage includes production and spread of toxic wastes, pollution of water, soil and air, erosion and ecological damage of landscapes, plants and animals. In cases of environmental injustice such impacts are unfairly distributed and most often affected communities have not participated in making decisions about such developments. 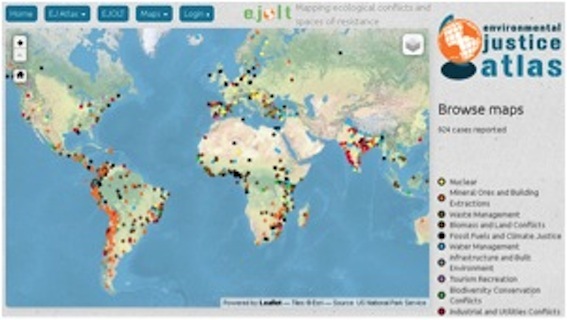 The EJOLT project is a scholar–activist collaboration — between universities and environmental justice organisations, such as FoE — that started collecting environmental case study data in 2012 to share and use for campaigning, advocacy, education and conflict resolution. contested management of the Toolangi State Forest. Developing more case studies is a priority in this first stage of the AEJ project. By working with FoE campaigners, engaging with affected communities and drawing on EJOLT research and resources (http://www.ejolt.org/resources/), in the next stage AEJ plans to develop fact sheets and reports that will include international benchmark practices and policies to assist impacted communities. The team will focus on activities such as: supporting collection and analysis of community experiential evidence; recommending preventative measures and improved standards in environmental policy and regulation; and, establishing safer sector and industry practices from criteria for development approval to monitoring, corporate responsibility, appeals and remedial legislation. AEJ will synthesise evidence of socio-environmental costs in communities where dangerous conditions, practices and incidents, such as toxic material use and waste, have been significant. Fact sheets and reports will be promoted for teaching, media, public, government and industry purposes too. Damaging impacts can be insidious, emerging in delayed and unexpected ways, and often disproportionately impact on disadvantaged (e.g. low-income, Indigenous) communities poorly positioned to research, advocate and campaign for solutions to environmental risks or damages. This project has been instigated by Anitra Nelson, an Associate Professor in the Centre for Urban Research in the School of Global Studies, Urban and Social Studies at RMIT University. Lisa de Kleyn is attached as a PhD student investigating conflicts in managing Toolangi State Forest from an environmental justice perspective. Anitra and RMIT Associate Professor Wendy Steele are supervising Lisa. A Masters by Research student, also focusing on a case of environmental injustice, is expected to join the team by early 2016. Other volunteers developing case studies and material for this AEJ page include: RMIT food security, alternative food economies and freeganism specialist Dr Ferne Edwards; sustainability specialist, forest activist and researcher Michelle van Gerrevink, nuclear and mining activist Michaela Stubbs, and VCA arts student Rachael Vieraitis, whose focus is arts activism. This page will also act as a clearinghouse offering links to other Australian environmental justice related archives.